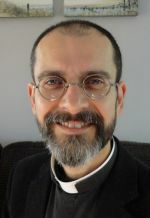 Revd Paul Overen is a Lay Development Officer and Assistant Diocesan Director of Ordinance in the Diocese of Norwich, Church of England. Ad edited version of the review was first published in September/October issue of ‘The Magazine’, a publication by Diocese of Norwich. Archbishop Justin has said that reconciliation is at the heart of the gospel (cf. Mt. 5.23–24). The Anglican Communion currently has two initiatives promoting engagement with reconciliation: Continuing Indaba and Living Reconciliation. The latter comprises of this book, pictured and reviewed here, and a further study guide (with Youtube clips) for use by study groups. The Zulu term ‘indaba’ (‘meeting’ or ‘purposeful discussion’) was used in the 2008 Lambeth Conference for a process of deep listening and purposeful conversation which aimed at developing shared understanding and common ground. The Continuing Indaba project of the Anglican Communion has involved people from different dioceses worldwide visiting each other to learn about life and mission in the other contexts, to foster trust and understanding and for conversations about the similarities and differences they have encountered. The aim is to enable us to live reconciliation and so become agents of reconciliation in the world. The book Living Reconciliation is by Rev Canon Dr Phil Groves, the Director of the Continuing Indaba process for the Anglican Communion, and by Angharad Parry Jones, who was for some time its Communication and Resource Manager (who went on to train for ordination in the Church in Wales). Living Reconciliation takes a practical approach to seeking reconciliation, drawing on the stories and experiences of those who have sought to live reconciliation, both from the Bible and from the experience of the indaba process itself. It is a frank book, acknowledging how difficult it can be to face issues of power and injustice and to find common understanding. It’s hard enough, as Justin Welby has elsewhere suggested, to find ‘Good Disagreement’ that is respectful of integrity and difference. I am reminded of a saying, sometimes said to be a proverb or prayer, ‘Help me never to judge another until I have walked in his moccasins’, (or as it was cited in Sharon Creech’s novel Walk Two Moons, ‘Don’t judge a man until you have walked two moons in his moccasins.’). Yet the book leads us ‘beyond respect’ to relationship, and shows how building of relationships can enable breakthroughs to be made, enabling us to dance to a different drumbeat than the war drums of conflict. The book and other resources help us to appreciate the call to live reconciliation, to respond in openness and humility, in a context of hospitality and prayer, and so enable us to be built up in love. I warmly recommend both it and the study guide to parishes.